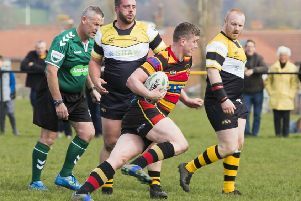 Halifax have climbed to fourth in Yorkshire Three following a gritty 21-18 victory over Baildon at Jenny Lane. Halifax needed to come from behind to beat the hosts, with Christian Heyhoe powering over for the winning try in the final few minutes. It wasn’t the performance player-coach Giles Hetherington had been after. However, Halifax had enough quality to sneak a third league win of the season. The lead continually changed hands throughout the clash, with Halifax their own worst enemies at times. Oliver Wilby continued his rich vein of try-scoring form from a textbook catch and drive, while Richard Cole added two penalties but Halifax still found themselves trailing 13-11 at the break. A long-range Nick Bell penalty edged Halifax back in front but Baildon must have thought that had snatched a win when they crashed over with 10 minutes left. Halifax didn’t panic, though, and some intelligent play saw them create the space for Heyhoe to cross with two minutes left. Cole added the conversion to seal the win.